Ever wondered what a typical day for a Digital Consultant entails? 1. Describe your role as Digital Consultant. My role as Digital Consultant at Mabo involves giving honest appraisals of potential clients Google Ad’s accounts and highlighting any opportunities for improvement. I introduce them to Mabo and our services to see if we can help them achieve their online goals. Alongside this I also look after our team of Business Development Executives, so I am responsible for the first point of contact potential customers have with Mabo. 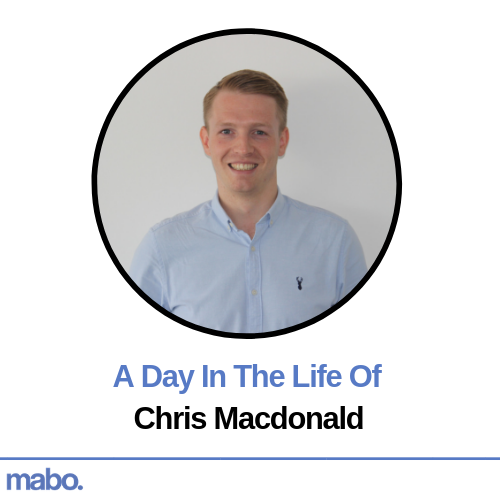 I started my journey at Mabo as a PPC account manager which gave me the skills to put my personality to better use in the sales team. The great thing about Mabo is that they are willing to create roles when they spot talent in a certain area. 8:00 – 9:00 Analysing sales stats from the previous day, organising my day ahead, responding to emails and motivating the sales team! 9:00 – 9:30 Preparation for the morning consultations, assessing accounts and looking for any areas of improvement. 9:30 – 12:30 Two morning consultations, appraisal of potential clients Google Ad’s accounts, highlighting opportunities for improvement and introducing them to Mabo and our services. 12:30 – 13:30 Lunch, usually involving a pastry based treat and beating my colleagues at Ping Pong. 13:30 – 14:00 – Preparation for the afternoon consultations. 14:00 – 16:00 – Two afternoon consultations. 16:30 – 17:00 – Personal development to increase my PPC knowledge and make sure I stay ahead of the game! Opportunities. People who are willing to work hard and go above and beyond for the company will be rewarded. The industry is well known for some agencies that take advantage of their clients. The most challenging part of my role is convincing them that Mabo really are different. The day you think you know it all, is the day you have failed. PPC is an ever changing world in which nobody will ever know everything there is to know. Drive your own learning and stay ahead of the game. Administrative Assistant at Daisy Communications. From Pies to Paella: Burnley FC’s journey back to European Football. Everybody is a genius. But if you judge a goldfish by its’ ability to climb a tree, it will live its whole life believing it is stupid. Help will always be given at Mabo, to those who ask for it. Learn a second language (or sign language) fluently. Visit all 7 continents (South America & Antarctica still to go!). Be on camera behind the presenter on Sky Sports Deadline Day. Bring Me The Horizon. (Sorry Scarlett). I can’t pick one so I’ll name three; Gladiator, Trainspotting and Life of Brian. RAF pilot. The poor eyesight soon put a stop to that. Outside of work, my passion is football and following my hometown club of Burnley. I’m also partial to a day sat freezing by a lake and wondering why I got up at 6am on a Sunday to drown worms.